So last time we were biting our nails wondering what would happen when the guys who were working on the Iron Smelting Furnace finally opened it! Well, first, let us give credit where credit is due! The smelting furnace, also called a bloomery, was created and operated by Otuell, Erikr, and Damales. Second, you need to understand the next steps in the process (the steps that I list are a rough approximation of the process and are only used in small scale production like this one). So, when a smelting furnace is opened, the iron should have melted out of the iron ore and formed what is called a bloom. This is just a mass of iron; porous and usually with slag around the outside. This bloom is removed from the furnace and placed in a blacksmith’s forge, and the air flow is increased to increase the heat and prepare the bloom for consolidation. This consolidation is accomplished by a considerable amount of hammering (forging) with a sledge hammer, followed by reheating, and more hammering. This process causes the slag to break off and the metal to be welded together into a solid mass. This process is repeated over and over again until the iron is “ready”. Having watched this process at Great Western War, all I can say is Wow! 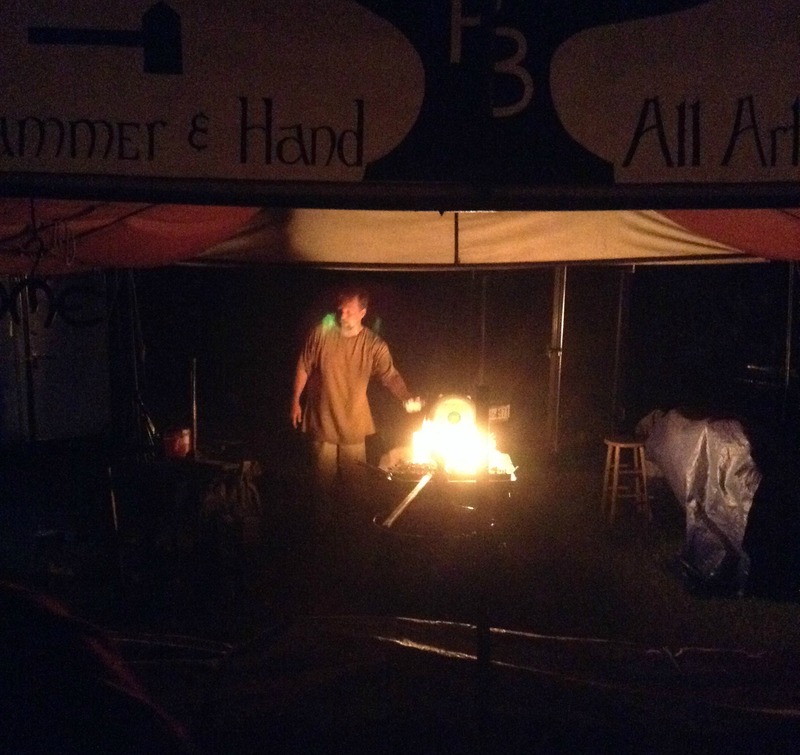 The fact that all of this process was occurring after dark made it equally impressive because it was easy to see the sparks flying and the glow of the forge and the bloom. So first let’s take a look at the first good photo that I have of the bloom. Notice the large glowing mass in the picture? Well, that is it! I believe that it had already been hammered on once when this picture was taken, so it started out even bigger. 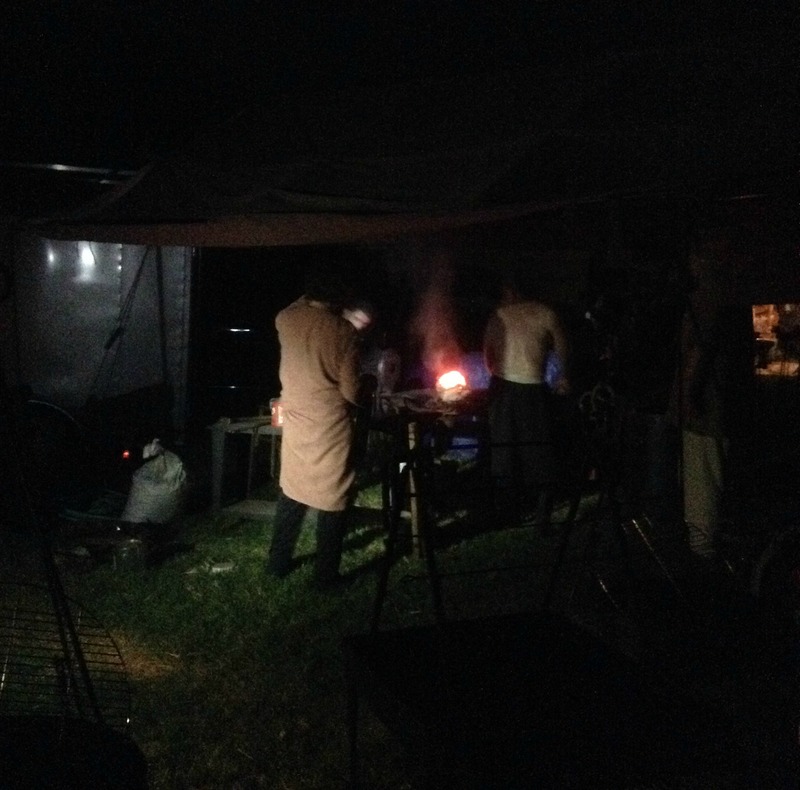 Then it goes back into the forge and the airflow is increased. Very impressive. And this is what it looks like when it is pulled out of the forge with a pair of long handled tongs and the hammering continues. Sparks everywhere! And now a couple of videos, just to show a few of the challenges that the workers faced. This short one shows a little hammering, and an unsuccessful transfer back to the forge for more heat. The person on the far left is actually using hose to put out any sparks and cool the many pieces of random slag that flew around. And in this last video we can see the bloom consolidations, being turned and hammered. The background conversation discusses the process. I have other videos, but the intelligent conversation in this one beat out some of the funnier adult conversations. I hope that this gives you an idea of just how much work went into the process! This is how iron was produced for a very long time. It really makes you understand why iron was such a valuable commodity. 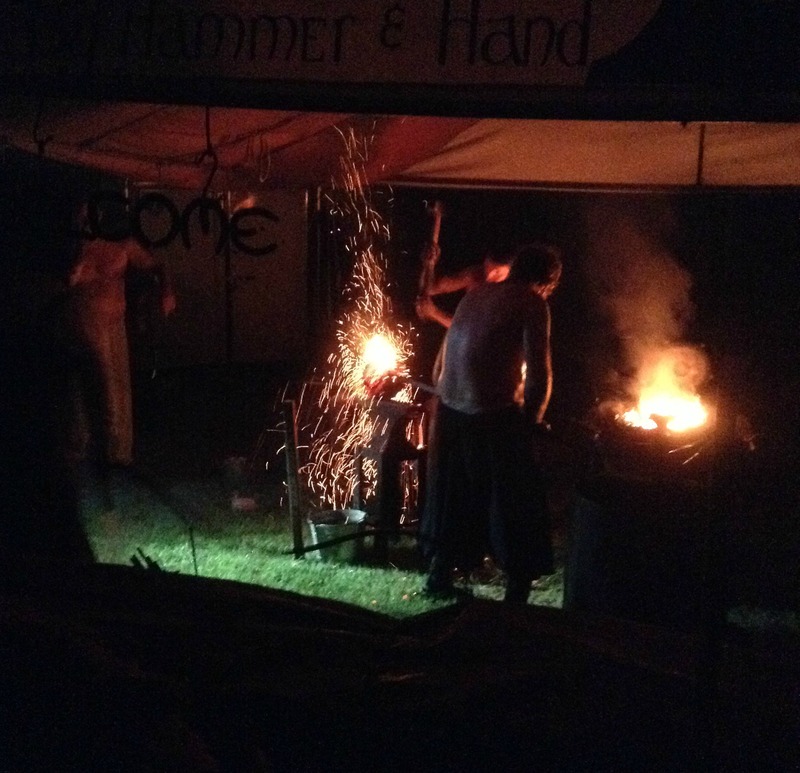 This entry was posted in Iron Smelting Furnace, Metal Working, SCA Life and tagged forging a bloom, forging iron, iron smelting furnace, iron smelting furnaces, smeltin iron ore at GWW, smelting iron, smelting iron ore at an SCA event by Eirny. Bookmark the permalink.